percent of which were based upon customer requests. 3D Printing brings a whole new dimension to the world of engineers, fabrication and designers. We’ve discussed at length in previous articles the many misconceptions about the world of 3D Printing. In the following article, I’ll focus on the true value of having a 3D Printer in your workflow as an engineer or designer. Just like anything else, a 3D Printer is only one tool among many. But using the right tool for the right job will open new possibilities. It can cut costs, and most significantly, save time. There’s a lot of hype in the consumer market right now. We all hear of big dreams of a 3D Printer of every home. But currently the technology really shines in prototype development. In particular, this is true for engineers and designers involved in new product development or the redesign of existing products. The ability to get your hands on prototype components, assemblies and complete products and review design issues, improvements and changes is quite simply, invaluable. Whether you’re building a tool or fixture, designing a new product, or developing a prototype, as an engineer or designer, you need to fail often and recover quickly. As we know, creating the best possible part design usually requires multiple iterations and redesigns. Previously you would have to wait weeks or even months to see a physical version of your design. But now, 3D Printing has made it possible to get that part created the same day or the next day. This allows creators to print the design quickly, review errors or find improvements, make the changes to the file and print again within a very short time frame. Today, you can go through 10 iterations in the same time it used to take to complete one using traditional manufacturing methods. Even if that print takes hours or days to complete, you’re still cutting your production cycle down to a fraction of the time spent using traditional methods. Rest assured, there is immense value in turning a design into an object in a timely manner. This is a phrase you’ll hear thrown around quite a bit in the world of Additive Manufacturing (3D Printing). Traditional manufacturing processes have certain limitations. If you’re using milling or using CNC (Computer Numerical Control) to create a part, you’re removing material from the outside of your block of material and working your way inward. This means any kind of complex internal shape is usually impossible. A CNC machine cannot wrap around corners, but when you’re building from the bottom up, the 3D printer has no problem building organic, complex shapes and structures. If you’re using injection molding, you have to worry about hollow parts, drafting and maintaining wall thickness. 3D Printing doesn’t care about complexity. 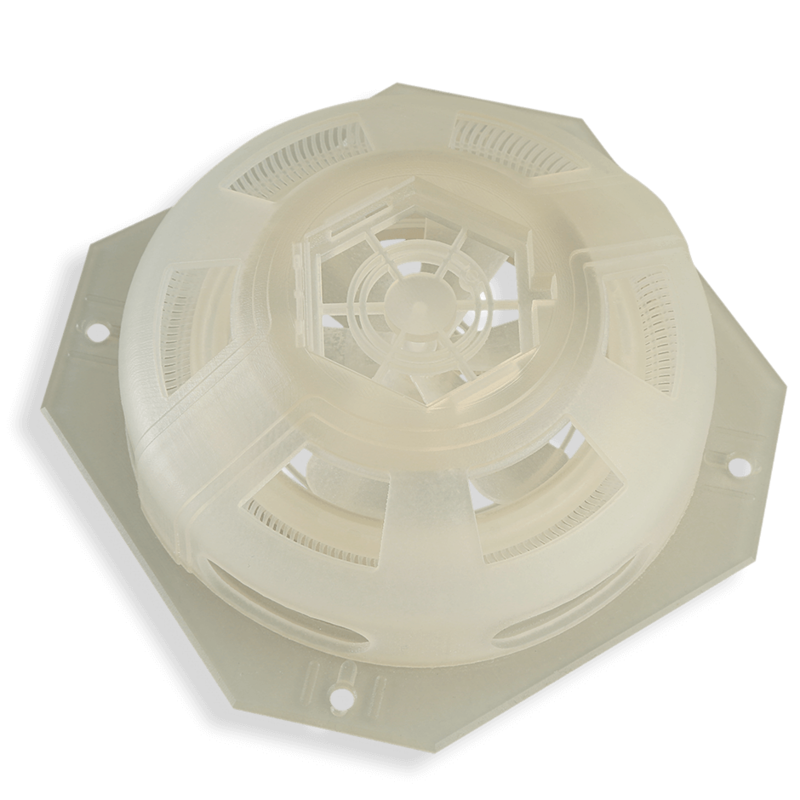 As long as you’re using some kind of support material system for your part – and using the right material and print method for the job – the complexity of your designs are virtually limitless. Please note that each individual printer will have it’s own limitations you’ll have to work within. However, having access to multiple printer technologies will give you a lot more freedom. Markforged offers a wide range of 3D Printers all specializing in creating parts strong enough for actual everyday use. Developed and manufactured in the United States, these are the only printers on the market that can print parts as strong as aluminum. Their printers generally use two printheads. One builds Nylon parts (or the amazing proprietary Onyx material). The other is a revolutionary new printhead that extrudes composite materials to reinforce the nylon to make solid, strong-as-aluminum 3D Prints. The composite materials used in the machine are Carbon Fibre, Fiberglass and Kevlar, and High-Strength High Temperature Fiberglass. The reinforced prints are up to 30 times stronger and 30 times stiffer than ABS 3D-Printed parts. Furthermore, the carbon fibre prints have a higher strength-to-weight ratio than 6061 aluminum. This enables you to create fully functional parts on the printer – rather than pieces prototyped simply for fit before being machined from metal. 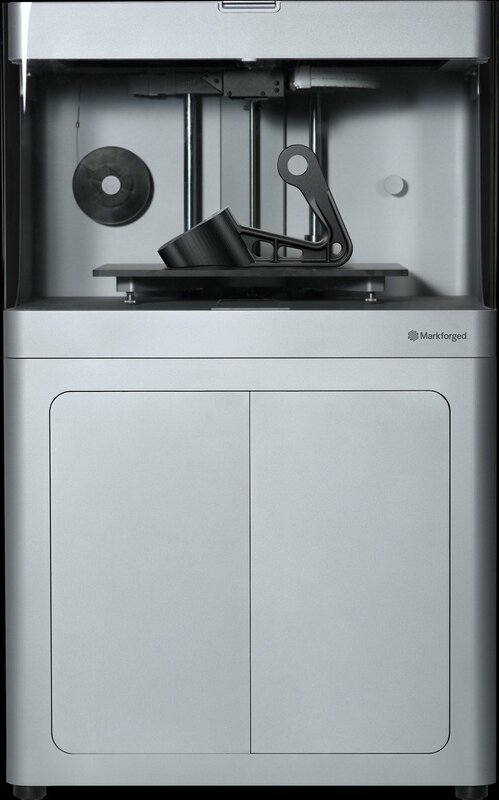 Markforged offers a range of options for those looking for more than the standard plastic-jet printers in the ‘prosumer’ price range. 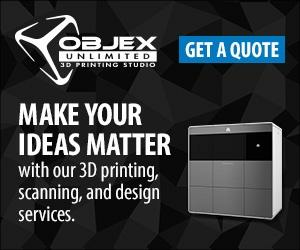 Starting at $3499 USD with the Onyx One 3D Printer. Even at its low price point, it has a place in the professional environment. It’s an excellent addition to the Engineer or Designer’s desktop (and totally safe for office use). The printer ships with everything you need to get started. Including cloud-based Eiger software, giving you full control over customizing your 3D Printed composite fibre model. If you need more materials, you can opt for the Onyx Pro, which has the ability to reinforce with Fiberglass, or the Mark Two, which can print the full range of materials available. Additionally there’s the Mark X, which can print everything the Mark Two can print. However, it has a much larger build size and has a built in scanner to check the part for deficiencies during the print cycle. Not sure if this printer fits your needs? Give us a call! 3D Systems is again pushing the envelope with new products to their lineup that support the usage of 3D Printers for end-manufactured parts. With new capabilities to accelerate additive manufacturing, the new products and materials were introduced to support the growing demand for investment casting, jewelry and dental markets, while extending its leadership in precision metal production for healthcare and aerospace. In addition to the previous lineup of the ProJet MJP 2500 and the ProJet MJP 2500Plus, 3D Systems has the a wax printer to the lineup: the ProJet MJP 2500W. The brand new wax printing system, along with the new VisiJet® M2 CAST RealWax™ material, is designed from the ground up for applications in jewelry and industrial casting. The new wax system combines the precision of the successful MJP 2500 platform with a next-generation 100% real wax material to deliver precise, durable, high-resolution patterns. Along with the new wax material for the ProJet MJP 2500 series, they have also introduced new VisiJet materials for the MJP 2500 platform with rigid properties for applications such as snap-fit assemblies. The advancements include a breakthrough dental model material in rigid tan (VisiJet M2R-TN), the most optimal colour for dental models to deliver superior visual contrast and precision. Other new materials include rigid black (VisiJet M2R-BK), rigid white (VisiJet M2R-WT) and rigid clear (VisiJet M2R-CL). In full-colour 3D printing, 3D Systems unveiled the ProJet CJP 260Plus for anatomical modelling in healthcare and concept modelling for accelerated product development. The ProJet CJP 260Plus is the company’s most compact printer for fast and affordable full-colour 3D printing, and offers full CMY colour in a closed-loop powder loading, removal and recycling system.